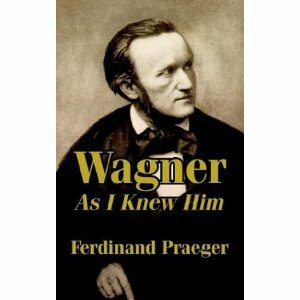 A Wagner biography written by some one who knew him and the book H.S. Chamberlain tried to ban. There is a wonderful overview of this over at Monsalvat which is repeated in part below and is much better than anything we could attempt. If you have not visited Monsalvat than we seriously recommend you should. According to Sir W.H. Hadow this book "was received with great alarm and indignation by the Wagnerians, partly because it fell short of unthinking hero-worship, partly because it gave a full and indiscreet account of the Dresden revolution, Wagner's part in which it was a matter of religion to ignore or minimize. The German version of the book was suppressed at the instance of H.S. Chamberlain ..." There can be no doubt that Chamberlain's efforts to suppress this book were motivated by the desire to eradicate all knowledge of Wagner's socialist views and of his revolutionary activities, which had become an embarassment to the reactionary "Bayreuth circle". Hadow concluded: "I have read many books on Wagner ... and have come to the conclusion that among contemporary biographies Praeger gives the truest picture." On the other hand Newman described him as, "generally untrustworthy", and he is sometimes misleading. Most of Praeger's account is based on what he was told by Wagner himself; in some cases it is likely that Praeger has misunderstood or that a conversation was less than perfectly remembered. It should also be kept in mind that Wagner did not always tell the whole truth and nothing but the truth. Praeger also relied in part on other unreliable sources and he was not always entirely truthful about his own friendship with Wagner. Despite these faults, the book is a fascinating account of Wagner as he was known to one of his friends. Two years Wagner's junior, like him Praeger grew up in Leipzig but settled in London from 1834. It was during a visit to Dresden in 1843 that Praeger was introduced to Wagner, perhaps by August Röckel, with whom he maintained a correspondence from which he quotes in this book. Thus Praeger's account of Wagner's revolutionary years is partly based on accounts by Wagner himself -- given during his Zürich years and so before he began to conceal his part in the Dresden revolt -- and partly on letters from Röckel, who served a thirteen-year prison sentence for his part in those events. Praeger and his wife got to know Wagner well at the time of his London concerts in the spring of 1855. This visit is described in detail, although Praeger might have exaggerated the part he played in the decision to invite Wagner. As well as being a writer, Praeger was a musician and composer. His accounts of the creation of many of Wagner's musical works, although based on conversations with Wagner and study of his scores (and in some cases manuscripts), are not always to be relied upon. For example, his comment that when writing Lohengrin Wagner composed the third act, then the first and second, is a misunderstanding based on examination of the orchestral draft of the score, which was composed in that order, although the earlier draft had been composed from act one to act three.